"All You Can Eat" Waffles, Breakfast Sausages, 9 different Flavored Syrups and Whipped Cream. Coffee, Milk and Juice are included. Tickets at the door will be $8.50. 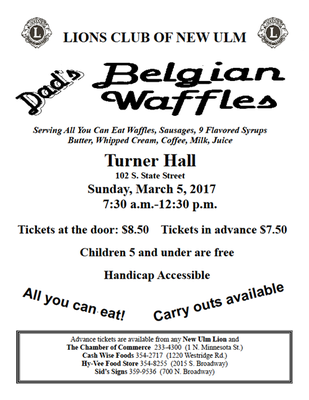 Children 5 and under are free! Carry outs available.